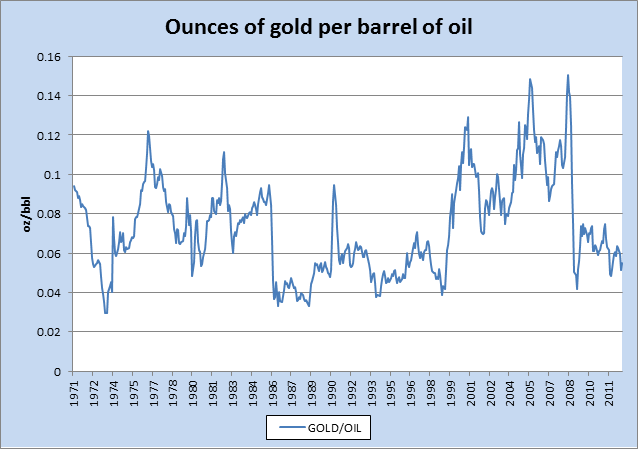 stickman's corral: Are charts of oil priced in gold really that impressive? 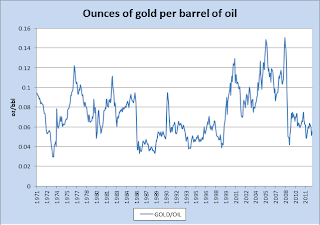 Are charts of oil priced in gold really that impressive? Following on from my last post, I've just clicked through to Chris's website and seen a post titled, Petrol Price in Gold Terms, in which he argues that the recent rise in South African petrol prices are "not owed to higher petrol prices, but a much weaker Rand, caused by the Reserve Bank". [I assume by petrol prices he obviously means oil prices.] He continues, "In hard currency terms, the price of petrol is unchanged since 2002." Energy is a fundamental input in mining activity. Gold mines, which are deeper and more complicated to run than virtually all other mining operations, are clearly no exception. In that light, why wouldn't we expect the price of gold to track what is happening in the oil market? It would be roughly analogous to me saying that cupcakes have stayed at a constant price... in terms of flour. Now, if you're about to argue that what I've said would hold for coal but not oil... Fuggedaboutit. The movements of coal and oil movements track each other very closely. So much so that oil prices are widely used as a proxy for coal prices when forecasting and hedging in the electricity industry (since they are also more liquid). This is true even in countries where oil plays an insignificant role in power generation. And, of course, mining companies still consume vast quantities of oil during their day-to-day operations regardless of which energy source fuels their electricity needs. Not much to choose between them, if you ask me. 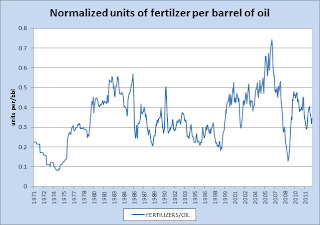 The point here is that virtually all commodities exhibit some kind of long-term mean relationship with oil. Indeed the increasing linkage between energy and non-energy goods was a driving factor in the commodities boom of recent years. Now, of course, scale matters here and it might be misleading just to eyeball separate charts. 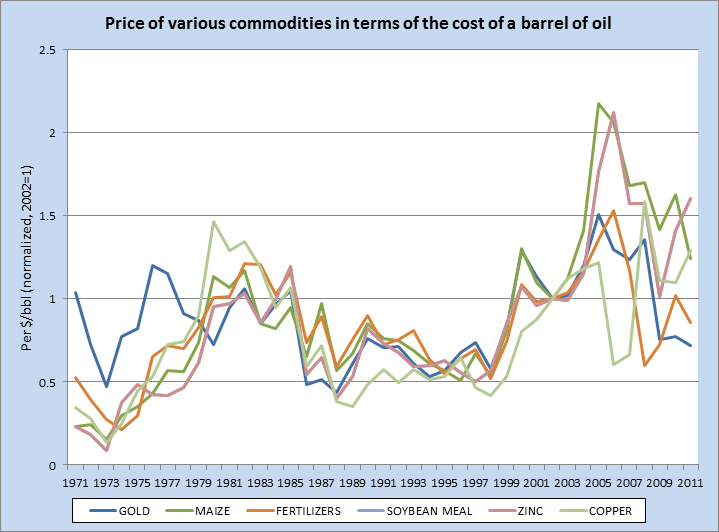 As one last treat then, here is a single chart containing the above commodities plus a few extra, normalized in terms of their respective units. (I pick 2002 = 1 for no better reason than this is the year that Chris used in his initial post.) 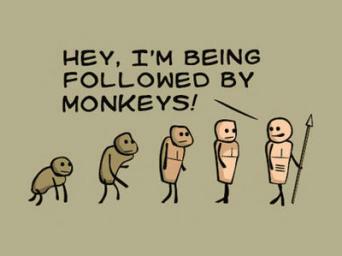 Again, I think the message is pretty clear. 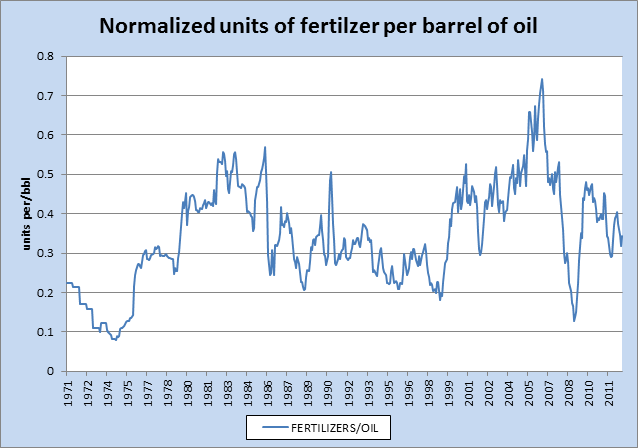 THOUGHT FOR THE DAY: All this talk about gold, but when are we going to have a serious discussion about the Fertilizer Standard, or the Soy Bean Standard? Hey bud, My argument is that it the exchange ratio of all commodities will tend to be more or less constant over time, but that the exchange ratio of paper monies will go down against all commodities. 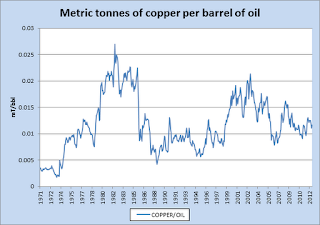 ... the exchange ratio of paper monies will go down against all commodities. As a definitive statement, this is not true. 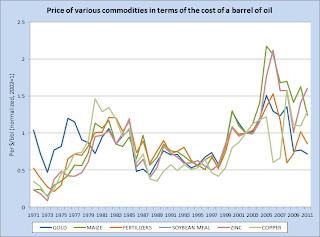 Commodity prices declined precipitously over a near three-decade period leading up to the mid-2000 boom. E.g. See Figure 1 of this paper. The point of the comment is to highlight that truism, it is not an argument in favour of whether the economy is doing "better" or "worse." 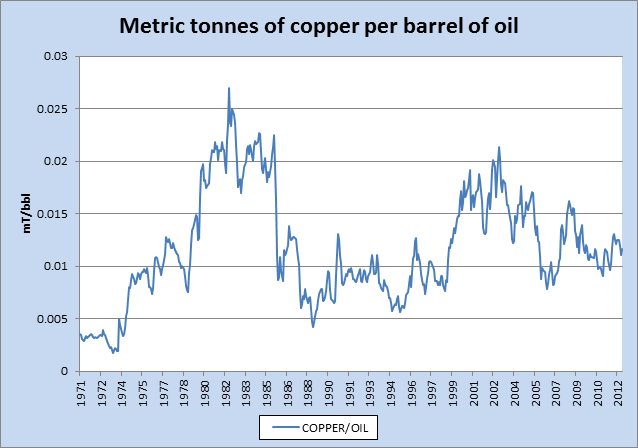 I get that commodity prices declined precipitously for a three decade period leading up to the mid-2000 boom, my argument is that prices would have fallen even further had it not been for the increase of the paper money supply before mid-2000. PS. You write "[I assume by petrol prices he obviously means oil prices.]" When I discuss the "petrol price", I am talking about the pump price of petrol you would put in your vehicle. Since when does a barrel of oil cost R12? If not, you are effectively saying "the high petrol price is not owed to higher petrol prices." I know that praxeologists enjoy their tautologies, but this is surely a step too far even for you! Clearly, option (a) makes no sense because it is internally inconsistent! Sam Harris on "Life Without Free Will"